I discovered sphagnum moss, a substance that you line pots with and place on the top to help keep the plants moist. I love it! 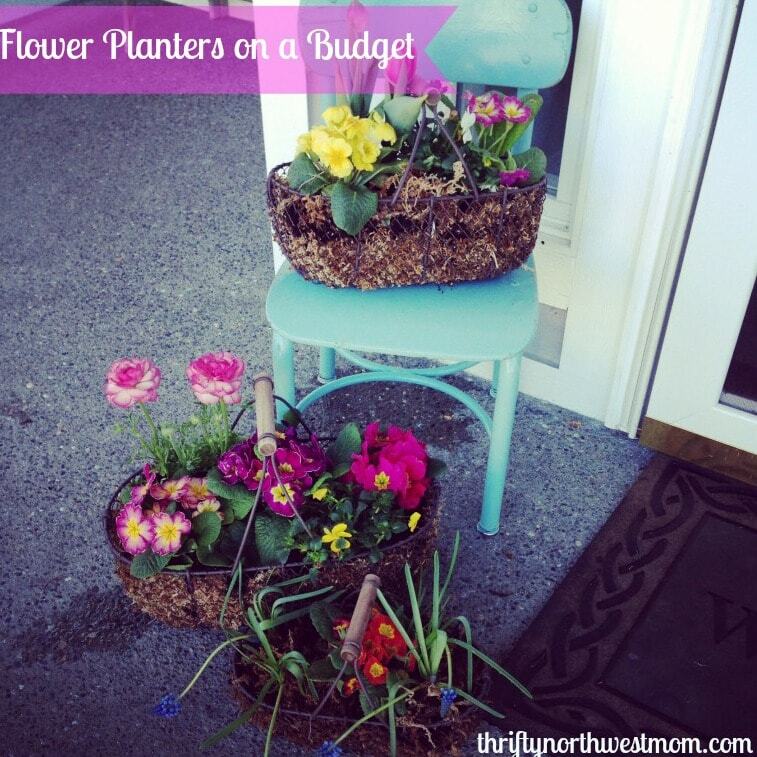 I was able to find it at Lowes for $7.00 a bag (which I used to plant a dozen medium sized chicken wire baskets). A little of this stuff goes a long way! I have to warn you it is messy, but what fun would gardening be if it wasn’t. (Sphagnum Moss is also available at Amazon or most local gardening shops). Now that I have discovered this moss, I keep looking around for some fun pots to help create a container garden on my front porch. 1) Spread out moss – First, like I said the moss is messy and it seems to multiply! My mom and I used a large empty rubber maid container to keep the moss in. This really helped-the first set of planters we did we tried to do them in the sink and it was a disaster! The Rubbermaid helped keep everything contained. 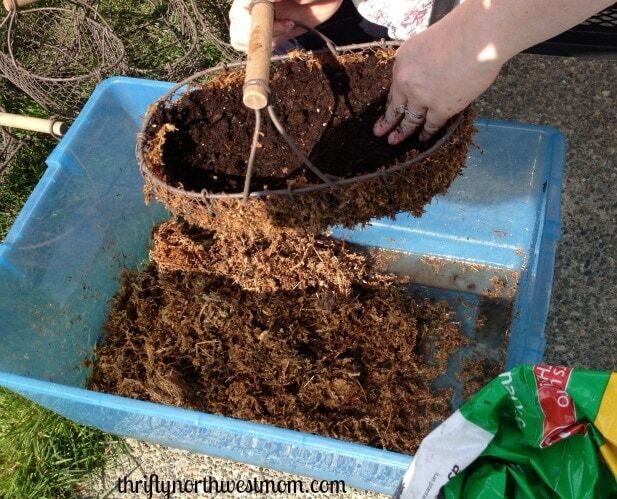 The directions on our bag of Sphagnum said to get the moss really wet before placing in the container. So we drenched the moss (we only used 1/3 of the bag at a time as to not waste it). The wet moss was much easier to work with. 2) Place moss in containers – After the moss is wet, we I would gather a handful, wring it out and then smash in the side of our container. 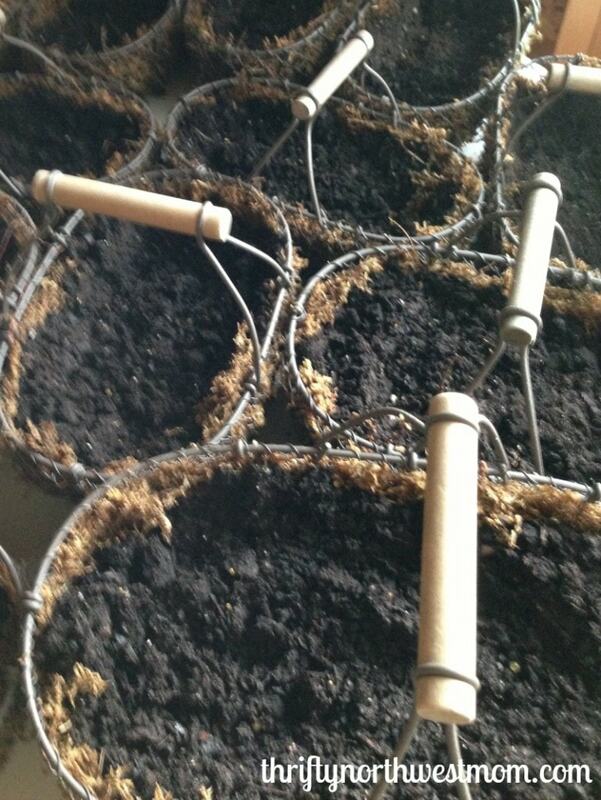 Place the moist moss all around the openings (chicken wire). This took a little time to get it covered but not too thick. 5) Moss over top of soil – Finally, we placed the sphagnum moss on the top of the soil-this not only makes it pretty but will help regulate the moisture and temperature for the plants. We used our planters for Easter gifts and we are getting a few made up for Mother’s day. I love being able to find recycled containers such as old colanders , old bowls or baskets and not be limited to their holes. 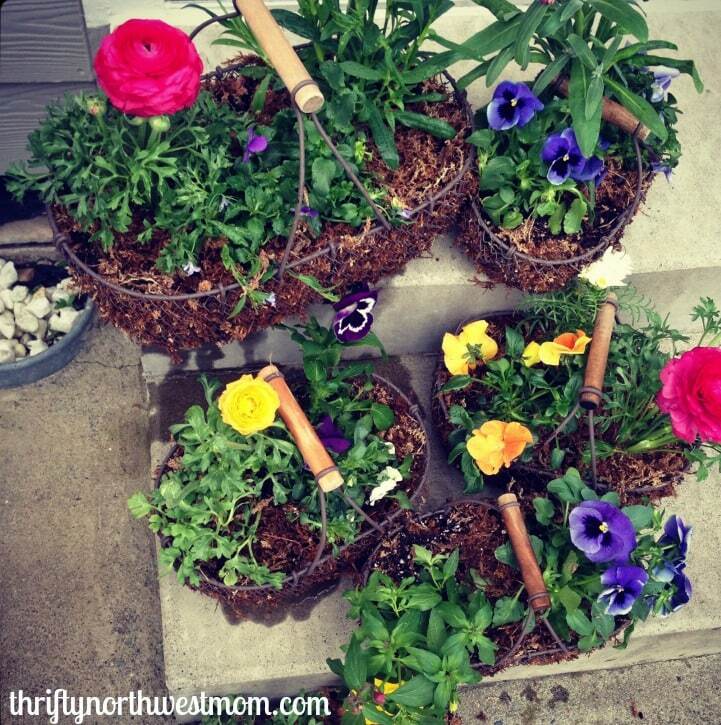 Any other ideas you have for items you have around your house to turn into flower planters? Show us pictures of your container gardens or pots!! What are some tips you have for making a pretty container garden? Find more frugal living recipes and DIY ideas here and a recipe database here.